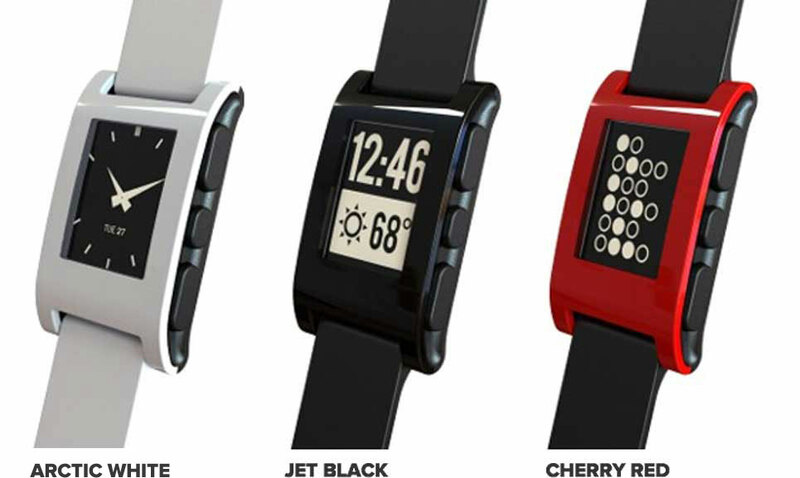 A long time ago, I put in an order for a Pebble watch which bills itself as an "E-Paper Watch for iPhone and Android." If you're not familiar with this, this was a Kickstarter success story. They initially appealed to the public for funding and got $10.2 million in about a month - pretty impressive. They've sold somewhere north of 75,000 watches and are scurrying to catch up with their backorders. They started shipping in March and I was somewhere in the low 40,000's and got my watch two weeks ago - in my opinion, they are making good progress. The watch is well-made and looks nice. It is a bit on the large size, which suits me fine as I have big wrists, but I'd be interested in hearing how people with smaller wrists feel about the size (this is a unisex, one-size watch at the current time). It does fine with random exposure to water, and lives up to the water-resistant claims (showers, dishwashing, etc. - haven't tried swimming with it yet). The look is sleek and clean. My only concern with the design is the durability of the "glass" screen. It feels like a tough plastic, and I'm thinking it will probably scratch over time so I plan to be careful where I wear this watch. I have gotten a lot of comments and compliments on the watch, as it looks very striking. I think the watch faces have a lot to do with this - they are very clean, readable, and can be changed to match your style or mood (you can have quite a few watch faces loaded on the watch, and cycle through them with the watch buttons). My favorite watch face is one of the "built-in" faces - the one that shows the time in words, as you can see in the picture above. The watch syncs easily with my phone (an HTC One) via Bluetooth, and automatically connects and disconnects when I'm out of range, with no intervention from me. I travel a lot, and the watch adjusts automatically to my local time zone, which I like very much. It is easy to download new watch faces using the browser on my phone. Once I download a watch face, it syncs to my watch and becomes available immediately. My favorite site for Pebble watch faces is AllPebble. It's also easy to download apps for the watch, though there aren't many of them yet. Pebble just opened up their SDK for developers, so expect we'll see a lot more apps soon (I'm hoping for one that acts as a pedometer and sleep monitor - the watch has the sensors to do it, it just needs the software. One of the coolest aspects of connectivity is the built-in music control. I can use my watch to start & stop music, and go to the next and previous tracks. I didn't think I'd use this very much but it has been a great way to control music while I'm driving without taking my eyes off the road. Another cool side benefit of the music controller app is that it will show the name and artist of the song on your watch face. Since it's paired with your phone, you can use the Pebble as a remote display for app notifications, SMS, email alerts, and things like that. This is pretty configurable - for example, I only use the watch for text messages, WhatsApp! alerts, and meeting reminders. The Pebble has a vibrating alarm, which is very nice - it is a non-jarring way to wake up, and I can set an early morning alarm without waking up my wife. Also, you can set the alarm directly on the watch, which means you can adjust alarm settings even when you don't have your phone or it's in Airplane mode. The watch warns you when it's running low on battery, and you have about half a day to charge it once the alerts start. Battery life has been very good. Pebble claims you'll get 4 to 7 days out of a charge, and I've been getting about 5 or 6, so the claims seem accurate. The variability is mainly a factor of 1) how many alarms and alerts cause the phone to vibrate every day; and 2) how much you use the backlight (you can have it come on automatically when you shake your wrist, or when you push a button). Charging is easy - the charging cable works on any USB port or USB wall charger, and has a magnetic charging "plug" that attaches to the side of the watch. The watch charges in an hour or two, depending on how low the power level was when you started the charge cycle. Be careful with your charging cable, by the way - they aren't selling extras until after they fill the full backlog of watch orders. In short, I'm very happy with the Pebble watch so far and can't wait to see what apps become available for it in the future.